This is a bit different from my usual posts, and it is not directly related to how well the blenders blend food. However, I hope blending enthusiasts will find it interesting, and there are a few lessons that may help you better understand your blender. I came up with two ways of measuring blender speed at home. If you’re interested, you can read the linked detailed account of my methods. Briefly, the first method uses an adjustable flashing light to “freeze” the motion of the blades, and the second uses sound recordings to analyze the pitch of the sound that the blender makes. Satisfyingly, the results of the two methods are consistent. The methods use widely available and relatively inexpensive materials, so most anyone with an interest could perform them at home. I tested a Vitamix Creations II, a 5200, a Pro 500, a 7500, and a Pro 750. The Creations II and 5200 are essentially the same model (see my Vitamix comparison page for a table with all of the equivalent models). The following speeds are for blades in an empty container with the blender set to either the minimum or maximum speed. I did not do a rigorous error analysis, but I’m relatively confident that these measurements are accurate to ~500 RPM and ~5 MPH. 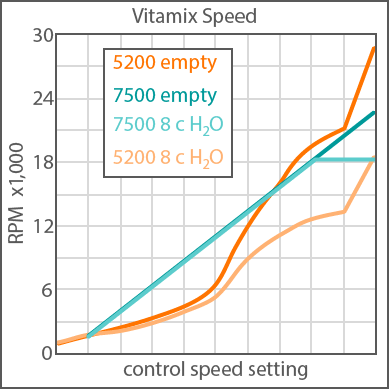 However, Vitamix’s listed speed of 240 MPH for the Pro 500 speed is wrong by ~17%. (The Pro 500 is the same as the Vitamix 6300.) My guess is that the marketing team mixed up the Pro 500 with the max speed of the 5200. The Pro 500 motor speed appears to be much closer to the Pro 750/7500 than to the 5200. Meanwhile, the 5200 is often claimed to spin at up to 37,000 RPM, which is a major overstatement compared to my measurements. I looked a bit further and found some references describe the 37,000 RPM as the “bare motor speed.” Without a container the maximum speed of the 5200 increased to 31,000 RPM—closer to 37,000, but still significantly less. I suspect that “bare motor speed” refers to the maximum speed of the motor completely unattached to any blender parts. (There is a cooling fan mounted on the motor shaft inside the blender, which slows it down from the bare-motor speed.) 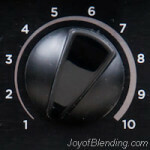 I believe 37,000 RPM is based on a real property of the motor, but Vitamix blades do not spin at 37,000 RPM. As far as real-life usage goes, the minimum speed of the Pro 500, 7500, and Pro 750 blenders is noticeably faster than that of the 5200, but it is not usually an issue for blending. When I want my 7500 to go slower (for example when using the bubble removal trick on a thin blend) I put it on the lowest speed and pulse. That said, all things being equal I would choose the wider speed range. I don’t know why Vitamix increased the minimum speed on these models. So far we’ve only looked at an empty blender spinning at the minimum and maximum speeds. Something interesting happens when we look at the intermediate speeds and also give the motor more resistance by blending something. The first thing I did was fill a Classic (3” blade) 64-oz container with 8 cups of water. 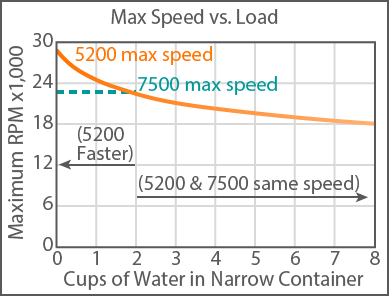 With an empty container, the 7500 speed is nearly perfectly linear (a straight line), while the 5200 speed increases but is not linear. In other words, the 5200 changes speed less evenly as the knob is turned. At increased load, all speeds of the 5200 change. On the other hand, the 7500 maintains the same speeds as the load changes, until the machine reaches maximum speed. I believe this is evidence of the “microprocessor control” acting as a speed controller that adjusts the power to maintain a set speed. For a given load there is a speed at which the motor will max out, and turning up the speed dial further will not change the speed. I have heard many people wonder if their 7500 machine is defective because of this behavior, but it turns out that this is by design—it’s the price to pay for keeping the lower speeds the same at different loads. The speed curve of the Pro 500 overlaps that of the Next Generation models, so it appears that the Pro 500 uses the same speed control as the Next Generation models (Pro 500 speed plot not shown because it just overlaps the 7500 plot). The obvious difference is that the Pro 500 uses the Classic enclosure (like the 5200) instead of the Next Generation enclosure. You might wonder, as I did, if the maximum speed of the 5200 and 7500 blenders continue to be the same at higher loads (thicker blends). To test this I blended 3.5 cups of hummus in a narrow container and swapped the container back and forth between the 5200 and 7500. I was surprised to find that their maximum speeds continued to be equal (12,000 RPM) in this case of a heavy load. I also measured the electric power draw of the two machines at this load using a Kill-A-Watt device and they were the same: 1600 watts. You can see evidence of this significant redesign if you look at the air intake vents. The 5200 has intakes at the bottom of the front and sides (below, left), whereas the 7500 has a large intake across the middle of the back (below, right) as well as a smaller one at the bottom of the front (not shown). I did not make any measurements of cooling because I couldn’t think of a reasonable way to do it, but I think it is plausible that the updated design cools the motor better. With my speed-measuring setup I can find equivalent loads between different containers. I found that 8 cups of water blended in a narrow container with the 3” blade spins at approximately the same speed as 4 cups of water in the wide 4”-blade container. These measurements show that Vitamix’s specifications are mostly correct, with a maximum blade speed of 28,500 RPM/250 MPH for the 5200 with 3″ blade and 22,700 RPM/270 MPH for the 7500 with 4” blade. Once the motors are significantly loaded (that is, they are blending something substantial) the Classic and Next Generation models deliver the same maximum speeds. The difference is that the microprocessor control of the Next Generation models keeps the blade speed perfectly linear and insensitive to what is being blended, except for when the speed maxes out at high loads and speeds. If you are curious about the details of how I made these measurements, check out the companion page: How to Measure Blender Speeds: Methods. Even without the power switch it seems to spin faster than a conventional blender. It is WOW! Have you tried to measure the RPM on the Pro750 with 32-ounce container? I am wondering if the 5200 and Pro750 have the same RPM of 28,500 in the highest setting with the 32-ounce container? The 32-oz container has the same blade as the narrow 64-oz container, so you can refer to my test results with the narrow 64-oz container. The answer to your question is that the maximum speed of the 5200 is slightly faster than the Pro 750 when blending less than 2 cups of water, and the maximum speeds are the same when blending more than 2 cups of water. You can see this visualized in the second plot, titled “Max Speed vs. Load.” Note that if you blend something thicker than water the speeds will be the same starting at a volume less than 2 cups. Hi Adam, thanks for the great site. I think I read your Vitamix comparison guide several times now. I’m planning on getting a refurb Vitamix but I’m still torn between the 5200 and the 6300. The difference in cost with the current sale going on is only $40. I was thinking that difference was small enough to go for the 6300 but then after reading your speed comparison, it seems like the 5200 has a wider speed range and is more in line with the advertised speed. 6300’s advantage are the 3 presets and a pulse switch. I understand that the presets may not be so useful. The pulse switch however I thought might give you slightly better control? Instead of flipping the on/off switch to pulse on the 5200, you could quickly just tap the pulse switch rapidly to get a very light/course chop? Not sure how rapid in successions you could flip the on/off switch on the 5200 to pulse and whether that would lead to damaging the switch more easily. Anyways for the price difference of $40, would you still go with the 5200 over the 6300? And are the speeds range between the two machine of any concern? Thanks in advance. The pulse switch is marginally more convenient, but, as you said, it’s functionally the same as flipping the on-off switch. Flipping the switch works perfectly well. I’ve never heard of a case of a Vitamix switch failing. As far as the speeds go, for most uses it doesn’t make a significant difference. The slower speeds of the 5200 are occasionally nice to have if you are trying to be gentle with a sauce (no splashing). It comes down to, how appealing do the presets and pulse switch sound to you? Ultimately the differences between the 5200 and 6300 are minor. Strobe technique is good, I used it to tune car engine. They should integrate the blend and go glass modules to fit 750.what a waste of money buying another unit at 3/4 cost. All in all the motor is light duty. The peak power 2.2HP is for a very little time, then the motor has to cool for few hrs after tripping. More the number of trips shorter the motor burnout time.The price is too high for the basic technology and material used. Simple practical design.Pressing membrane switches is not user (agronomic ally) friendly, like in other models. Adding of feedback control is nice ( thyrister control with hall sensor feedback.) But they should have models with 2.2 Hp continuous not pulsed. Lastly it the blade speed, that finally matters 240 t0 270 mph.The noise is basically reduced by introducing wider blade of 4 inch and reducing motor speed. small increment of peak power and improvement of air flow also helps little bit in motor trip. compact high power motor design is the most critical future improvement, maybe using neodymium magnet rotors and cooling methods completely avoiding carbon brushes. The 7500 is rated for 50/60 Hz. The Vitamix website and the 7500 manual list it at 50/60 Hz. I did just check my 7500 and it only says 60 Hz on the bottom. I do not have any further information. Adam ,Thank you very much ! That is the acceptable input frequency from the AC power line that you plug it into. Does electronic speed control help avoid air bubbles at all? I find with the 5200, when an air bubble forms in a thick blend, the motor speeds up because of the lack of resistance, compounding the issue and making it unrecoverable without tamping. Would the 7500 maintain its speed and recover from the air bubble, or does it make no difference? Interesting question. The short answer is that I don’t think that the electronic speed control would make a difference. With a thick blend, you should do most of your blending at maximum speed to minimize the chances of overheating the motor, and at that point there isn’t going to be an appreciable difference: The speed vs. load characteristics of the 7500 and 5200 are the same once you have 2 or more cups of water. The electronic speed control will maintain a set speed for the lower speeds independent of load, but I don’t think that would help much with preventing the air bubble formation. However, the wider design of the 7500 container can make air bubbles less likely to form…. This post is very interesting. Could you please do a measurement of the RPM for the Vitamix 5300? I’d like to see how it measures up in terms of RPM performance compared to the 5200 and 7500. Would it behave more like the 5200 or the 7500? I know that it’s somewhat of a hybrid model, and I’d like to see if it behaves more like the 7500 which would confirm that the motors are largely the same, with the difference being just primarily the sound damping. While I have not measured the 5300, I have seen it in action and I have every reason to believe that its speed curve follows that of the 7500. 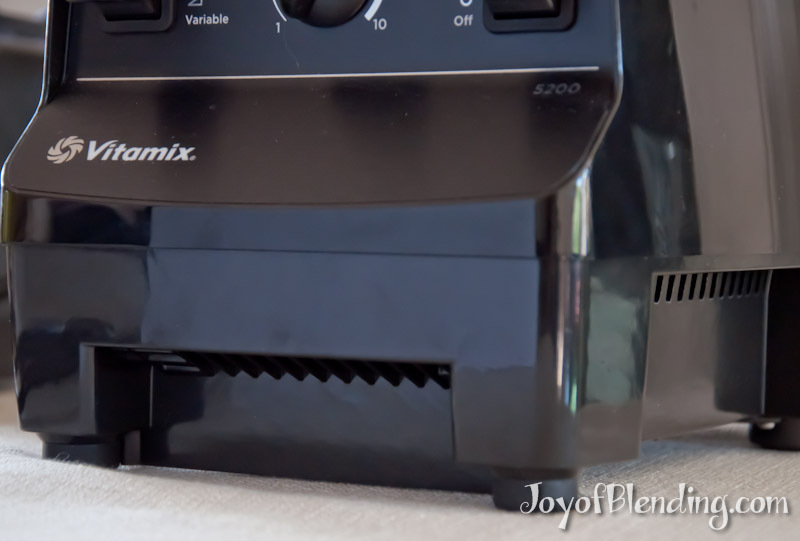 The motors between any of the full size Vitamix machines are not significantly different, as seen by looking at how fast they spin at a given load. The differences in the speed curve have to do with whether they have the electronic speed control, which the 5300 does. The real difference between the 5300 and 7500 is the base design—some of it you can see from the outside and some of the changes are internal. 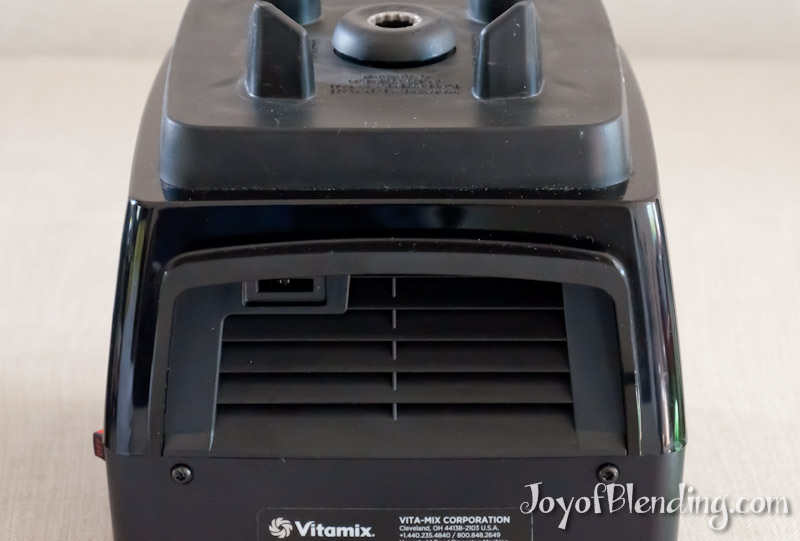 In addition to the enhanced sound damping on the 7500, Vitamix says the air flow is more efficient to keep the motor running cooler. Power is posted as 750 and 790 Wt, but no information about RPM for these models. What is RPM for these models? I measured the S-Series RPM and published it over on my S-Series review page. From that page, S-Series Minimum speed = 1,800 RPM (13 MPH blade tips); Maximum speed = 21,000 RPM (160 MPH blade tips). I just bought a 750. The first two speeds do not seem to differ at all. Speed picks up a bit on the 3rd, and jumps suddenly between 3rd and 4th. Is this normal? Trying to decide between a 5200 and 5300…. Can anyone shed any light on if either has an edge in performance or quality? The only really significant difference is the container. Shorter and wider on the 5300 vs. taller and narrower on the 5200. The two containers each have advantages and disadvantages. I wrote about them in this section of my Vitamix comparison page. 1)Which vitamix would you purchase ..given your speed tests? Obviously b,ending hummus or smoothies vary…so direct the answer my question relative to green smoothies only. 2) and how does the vitamix 750 compare to the nutri-bullet r/x…reparative to smoothies . The result of the speed tests is that for any significant load (which includes green smoothies), all Vitamix machines have the same maximum speed/power. For green smoothies, I like the wide containers, because the greens are more likely to fall into the blades without needing to poke them with the tamper. (Using the tamper isn’t a big deal, but not having to use it saves a tiny bit of time/effort.) See my comparison page for all of the machines that come with a wide container. I haven’t tested the Nutribullet RX, but there are a few things that would make me wary about getting one. I’ve heard from many people that their Nutribullet broke. I believe the Nutribullet warranty is 1 year vs. 5 to 10 for Vitamix. And the Vitamix customer service is much more generous within that period. For example, if you have to send something back to Vitamix, they will send you a prepaid shipping label, whereas you would have to pay yourself to ship back to Nutribullet. One other issue: for serious green smoothie makers, the larger Vitamix containers are very useful. Greens are bulky, so even if you aren’t making a giant smoothie, it’s easy to fill up the Vitamix container with pre-blended greens. The wide Vitamix container I recommended has a 64-oz blending capacity, but it actually has quite a bit more headspace, which is great for accommodating bulky greens. The Nutribullet RX is 45oz, with essentially zero headspace.